In applied economic research computable general equilibrium (CGE) models in which the behavior of economic agents are modeled, are widely used. In many CGE models, the linear expenditure system (LES) is used to model the behavior of the household sector. The disadvantage of LES is that the Engel curves, describing the relationship between expenditure on a certain commodity and total expenditure, are straight lines. Moreover, the LES does not allow for the existence of inferior commodities, elastic demand and gross substitution. An alternative model for the household block is the indirect addilog system (IAS), which is as simple to implement as LES, but which does not suffer from these theoretical deficiencies. In this paper, we test the LES specification against the IAS specification in case one disposes of a budget survey. 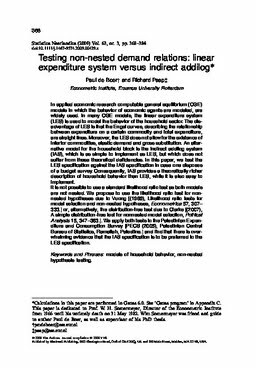 Consequently, IAS provides a theoretically richer description of household behavior than LES, while it is also easy to implement. It is not possible to use a standard likelihood ratio test as both models are not nested. We propose to use the likelihood ratio test for non-nested hypotheses due to Vuong [(1989), Likelihood ratio tests for model selection and non-nested hypotheses, Econometrica 57, 307–333.] or, alternatively, the distribution-free test due to Clarke [(2007), A simple distribution-free test for nonnested model selection, Political Analysis 15, 347–363.]. We apply both tests to the Palestinian Expenditure and Consumption Survey [PECS (2005), Palestinian Central Bureau of Statistics, Ramallah, Palestine.] and find that there is overwhelming evidence that the IAS specification is to be preferred to the LES specification.